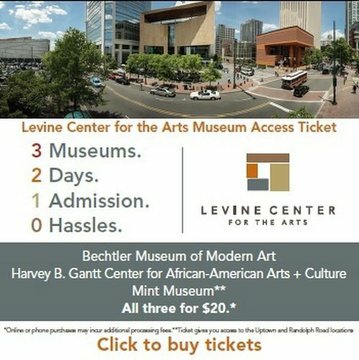 Levine Center for the Arts is one of Charlotte’s major cultural destinations, home to Bechtler Museum of Modern Art, Harvey B. Gantt Center for African-American Arts+Culture, John S. and James L. Knight Theater and Mint Museum Uptown. The Center was made possible through the support of the City of Charlotte, Mecklenburg County, Campaign for Cultural Facilities, and The Leon Levine Foundation, one of the country’s largest and most impactful philanthropic organizations, along with the generosity of Bank of America Foundation, Wells Fargo Foundation, and Duke Energy Foundation, among many others. Levine Center for the Arts is located in Charlotte’s Uptown neighborhood on South Tryon Street between Stonewall Street and West Martin Luther King Jr. Boulevard. Parking is available in the parking deck of the Duke Energy Center as well as in nearby public parking areas. The nearest LYNX Blue Line light rail stop is the 3rd Street Station at the Charlotte Convention Center.